A jihadist group in Syria has demanded that Christians in the northern city of Raqqa pay a levy in gold and accept curbs on their faith, or face death. The Islamic State in Iraq and the Levant (ISIS) said it would give Christian residents "protection" if they agreed to the list of conditions. The announcement came in a statement posted online. Correspondents say ISIS is trying to implement an extreme interpretation of Islamic law in areas it controls. Raqqa, seized by ISIS last year, was the first provincial capital to be completely in the hands of rebels. The directive from ISIS, citing the Islamic concept of "dhimma", requires Christians in the city to pay tax of around half an ounce (14g) of pure gold in exchange for their safety. The statement said the group had met Christian representatives and offered them three choices - they could convert to Islam, accept ISIS' conditions, or reject their control and risk being killed. "If they reject, they are subject to being legitimate targets, and nothing will remain between them and ISIS other than the sword," the statement said. A group of 20 Christian leaders chose to accept the new set of rules, ISIS said. Raqqa was once home to about 300,000 people, with less than 1% Christian, according to AFP news agency. Many Christians fled after ISIS started attacking and burning churches. The group has been accused of serious abuses in the areas it controls. Raqqa has seen fierce violence between ISIS and rival groups fighting the forces of President Bashar al-Assad. 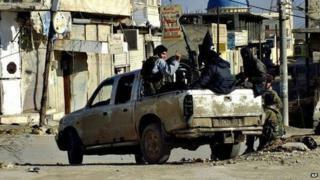 More than 2,000 people are believed to have been killed since Western-backed and Islamist groups attacked ISIS strongholds in early January.